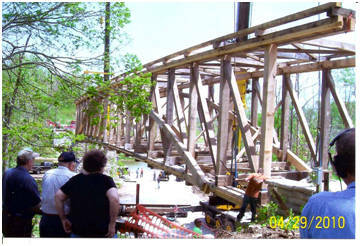 May 28, 2010 - First of all, we wish to thank each and every one of you for your generous donation to the restoration of the Moscow Covered Bridge that was picked up and thrown into the Big Flatrock River on June 3, 2008 as the result of an F-3 tornado that went thru our area. 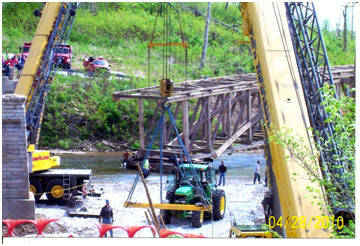 As you can see from the above photos, our beloved two-span, 330-feet Kennedy Covered Bridge which was built in 1886, the rebuilding process is well under way with the first span of two being pulled across the river (unusual in itself), lifted by two cranes and put into place on April 29, 2010. All that was needed to complete the move was one final nudge from a crow bar and it was in place. The moving of the second span is tentatively scheduled for Wednesday, June 9th. If the move is similar to the first span, it should be completed around noon of that day. If you would like to be on the emailing list to witness this historic event, email us at gowdy@usa.com and I will add you to our list of people to be notified. This same list will inform you of the reopening and dedication service for the bridge which should be later this summer. Once both spans are in place, flooring, siding, roofing and other necessary jobs will be completed. It should be noted that while a lot of new timber is being used in the bridge, about 40% of the timber from the original 1886 bridge is also being incorporated. The project is the result of a plan co-chaired by Indiana Governor Mitch Daniels and CSO Architects executive Jim Schellinger that has been funded by donations with no government funding. Approximately $1,000,000 of timber, labor, services and materials have been donated. Cash donations in the amount of $491,000 to date have come from the Eli Lilly Disaster Relief Fund ($355,000) with the remaining $136,000 from companies and individuals like you. We do anticipate that we may need an extra $20,000 for roofing and other unexpected expenses that might come up before the project is completed. To learn more about this project, go to www.moscowbridge.com. We also want to invite you to our 25th annual and final Moscow Covered Bridge Festival that will be this coming weekend (June 4-6). There will be plenty of food, entertainment and fun for the whole family plus a chance to see firsthand the progress that has done by contractor Dan Collom and engineer Jim Barker. We know that you will be impressed! An extra added attraction to this year's festival that is not listed on the schedule (due to last-minute arrangements) is the appearance of country legend Little Jimmie Sizemore of the father-son team of Asher Sizemore and Little Jimmie fame. They were members of the Grand Ole Opry in the 1930's and 1940s, had their own radio show and sold countless mail order song books. Check out http://obsecurecountry.com/sizemore.html for more on this living legend who will be performing on Friday, June 4 at 5 p.m. and will be one of the Grand Marshals in our parade at noon on Saturday.